In this issue: First a little fun, then a new release with a twist. Have you ever wondered what writers do when they get together? 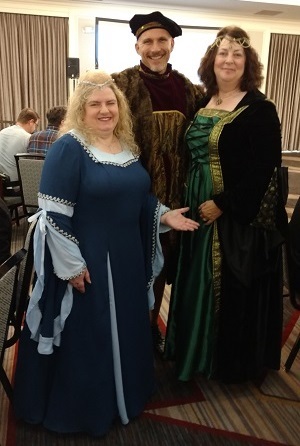 The fact is, we’re an odd group, and it’s just possible that science fiction and fantasy authors are the weirdest of all. Yep, that’s a real sword I’m holding. 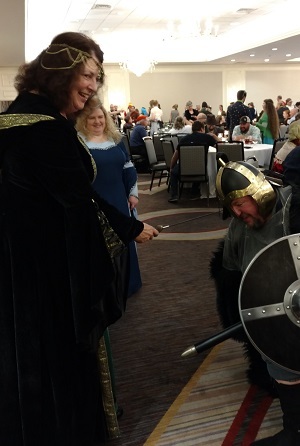 In what other profession would I get to be a duchess during a business trip? I got another chance to dress up in August, but this time it was as mother-of-the-bride. My husband and I are delighted to welcome Laura’s new husband, Joshua, to our family. By the way, Laura is not only a delightful daughter but also the graphic designer behind the book covers in the Agents of Rivelt series. 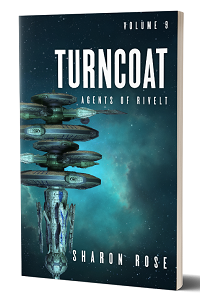 Speaking of which…drum roll…Turncoat releases today (Sept 13, 2013). 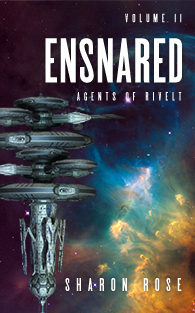 This is the latest short story in the Agents of Rivelt series. Just when answers come to light, the threat worsens. Are you the sort who waits until a series is complete before reading it? If so, it’s about time to grab the earlier titles and start reading. Each of these short stories can stand alone, but there is an overall plot arc across the entire set. The next two will end it with a bang. But first, you can find more details on Turncoat here. These were super fun to write! I’m in the editing process at the moment. 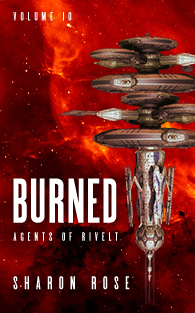 I’ll release them as close together as possible, because when you get to the end of Burned, you’re going to want Ensnared.